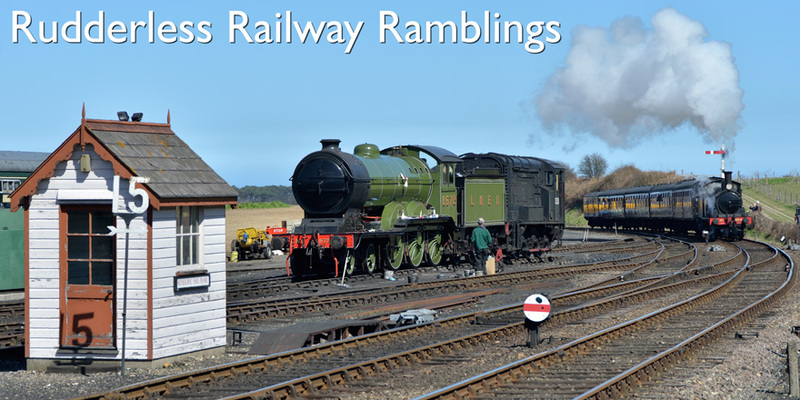 Rudderless Railway Ramblings: BR's last standard gauge steam loco? BR's last standard gauge steam loco? August 1968 is well known as being the end of main line steam on British Railways, the final surviving locomotives being mainly ex-London Midland & Scottish Railway class 8F 2-8-0s and class 5MT 4-6-0s with a smaller number of BR standard types (not forgetting the three 1ft 11¾in gauge ex-Vale of Rheidol Railway 2-6-2Ts). But this particular locomotive is believed to have still been in service with BR as late as 1972! This LMS class 3F 0-6-0T 'Jinty' No.47564 was built by the Hunslet Engine Co Ltd in 1928 as LMS No.16647 and was withdrawn in March 1965 before being converted to a stationary boiler (No.2022) for carriage heating at first Holyhead then Red Bank Carriage Sidings in Manchester… where it remained until 'preserved' in 1972. Acquired by the Midland Railway Trust for spares it is one of four 'Jintys' to be found around the Swanwick Junction site… I doubt it'll ever turn a wheel under its own steam again though… or heat a carriage for that matter. An undated photo of the loco in its latter BR days can be found on this page (scroll down to 'Manchester Red Bank') on the excellent AbRail Rail Databases website along with a huge amount of information and photographs relating to other stationary boilers.